In most dating sims, you can rest assured that if you pour time and effort into winning a character’s affections, you’ll have the option of ending up with them. 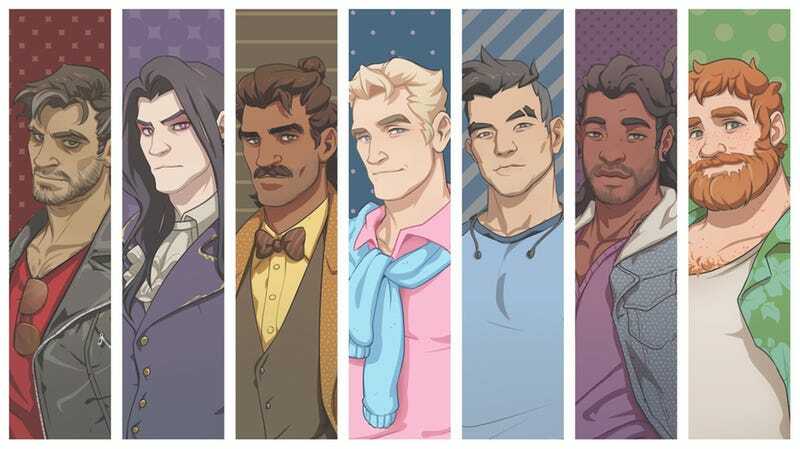 In dad-tastic dating sim Dream Daddy, however, that’s not always the case—a fact that’s made some players upset. I recently spoke with creators Leighton Gray and Vernon Shaw about that. Warning: Dream Daddy spoilers ahead. Dream Daddy is a game in which you’re a single dad trying to juggle raising your teenage daughter and going on a series of “dates” with other dads. When it came out last week, players were confused as to why they couldn’t get Joseph, the cool youth minister dad, to get with them even after they did everything right. Joseph, the only blushing, doe-eyed dad in the game who’s not single, has a wife, Mary, but their relationship is on the rocks. Mary seems to be cheating on him. As the new hot dad on the block, your character can flirt away multiple days with Joseph in hopes of winning him over. Gray and Shaw, however, didn’t want to tell a story where the player character helps end a marriage. It didn’t feel right to them. Gray admitted that she was surprised by how many people were vocally upset about Joseph’s ending. Joseph’s wife Mary, Gray explained, was intended to come off as a crappy person during Joseph’s story, but you’re meant learn about her more redeeming qualities in bits and pieces throughout other dads’ stories. Taken as a whole, their portrayal of her character was intended to get players thinking about how they play dating sims. Disclosure: a friend of mine, Jared Rosen, contributed some writing to Dream Daddy.